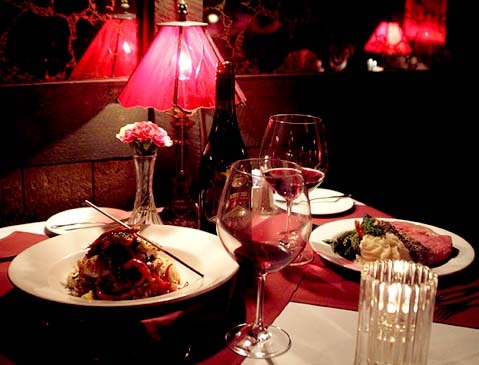 At The Jacksonville Inn you will enjoy distinctive cuisine and fine dining – near Medford, Oregon. Our superb restaurant features fresh seafood (salmon, Ahi, halibut, crab), stuffed hazelnut chicken, prime rib of beef, lamb, and variety of “healthy for your heart” selections. Dishes are prepared using fresh herbs and spices, many grown organically from the gardens on the premises in Jacksonville, Oregon. Indulge yourself with one of our 2,000 wines available and delectable Inn-made desserts. You can relax on our beautiful garden patio, perfect for warm summer evenings; chosen “Best Patio in Southern Oregon” by Mail Tribune, 2008. Created with the freshest ingredients – A great way to begin your day of Jacksonville adventures! Available Monday through Saturday from 7:00 a.m. to 10:30 a.m. Enjoy a mid-day break with us. Lunch is served from 11:30 a.m. to 2:00 p.m. Wednesday through Saturday. Served Monday through Saturday from 5:00 p.m. to 10:00 p.m. and Sunday from 5:00 p.m. to 9:00 p.m. Experience our many exquisite evening entrees and fine dining. Reservations are suggested. Expertly crafted entrees will delight your taste buds. The Bistro offers a variety of delicious menu items served in smaller portions in a casual atmosphere. Reservations are not accepted in the Bistro area. Bistro dining is available Monday through Saturday from 4:00 p.m. to 10:00 p.m. and Sunday from 4:00 p.m. to 9:00 p.m.
Join us for a lovely Champagne Brunch served from 7 a.m. to 2 p.m. Reservations suggested. Please place your order before noon the day of the Picnic. It doesn’t have to be a concert day! Join us after Britt for our Late Night Menu.